This document is a bullet point list of tips to consider when designing a project. Use these as suggestions only and determine if any are applicable to your own projects. amazing, I had to draft a proposal in a limited amount of time, I found this product ordered it and it worked perfectly. I nailed the client and will be using it again." This Project Design Tips is included in an editable format that can be customized for your own needs. How do you write a Project Design Tips document? Update your site to retain repeat visitors. Periodic updates are essential so plan an update schedule. The less frequent the updates, the more general the content should be and can use more DHTML randomizing techniques. Also reduce the number of outside links to prevent broken links. Surfers will generally wait no more than 20 seconds for a page to load and usually will only remain for 20 to 60 seconds. Home pages and index pages must load quickly. Large downloading pages and cutting edge technologies should be buried a level in the site rather than kept on the home page or primary index pages. For example, a full screen photograph should be accessed by clicking a much smaller 2nd image and faster loading thumbnail. A large Java applet should be accessed by clicking a link Tell the surfer what to expect and how long to wait. Know your intended target audience. Studies show that visitors want fast loading pages and useful information. The least important features are "bleeding edge" technologies, flashy animations and non-functional eye-candy (unless that is what you are selling and what your buyers are looking for). Learning web programming is very easy, the hard part is learning to do it right, what not to do and learning tasks that are normally performed by a team of specialists (designer, copywriter, marketer, programmer and graphics artist to cover just the basics). Never play music files the user has no control over; Music tastes vary, and most surfers will hit the back button rather than the volume control. This may count in your log as a hit but you will have lost the visitor forever. Flashy animations and eye-candy usually are only interesting once. You must rely on fast loading useful content. Allow visitors to bypass your Flash animations and splash screens. Do not use frames unless you are an expert. Frames cause more problems than they solve. Each page of the site must be consistent and intuitive to navigate. More and more web surfers are computer illiterate. Make your site easy for anyone to understand and use. If you are selling something, remove all obstacles to the sales process to make it easy for customers to want to do business with you (prices and order forms must be easy to find and use). Commercial sites must do everything possible to establish trust (full disclosures and policies, contact information, secure ordering, professional look, third party endorsements and testimonials). Many of the best sites on the Internet are content laden - useful information which is freely distributed. Include information relevant to your audience (i.e. how-to articles, tips and tricks, industry related news, etc. Your most qualified leads will most likely come from non-web advertising and/or highly targeted on-line advertising first, links from related websites second and search engines will be the third source of leads. You must take advantage of all these marketing methods and keep up with trends in the industry. Push content has come and gone, banner advertising and pay per click programs are becoming obsolete, affiliate programs are now in. It is necessary to keep up with the rapidly changing face of the Internet. Website traffic starts slowly at a new site, builds, plateaus and then declines. To get the best results from your website, you must market constantly and update regularly to build traffic and prevent it from declining. When selling a product or service, it must be easy for the customer to make the decision to buy without needing to contact the company. Many sales are spur of the moment and will be lost if the visitor cannot order a product immediately. Consumers will not always buy only on price; they will navigate and return to sites they feel they can trust. Customer service is imperative to your success. Gather opt-in e-mail contacts with customer permission whenever you can and follow-up. Your site must be designed with your visitor’s needs and capabilities in mind. 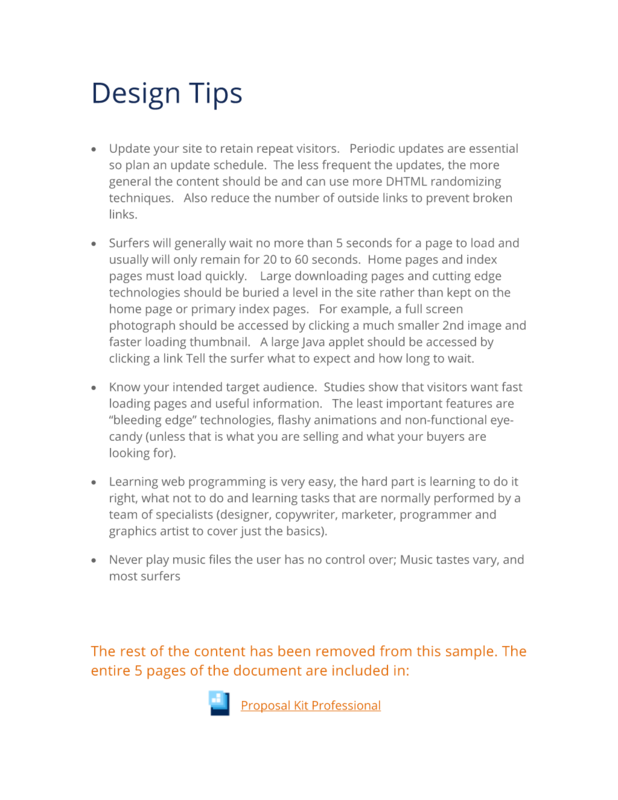 Pages must be fast loading and content must be useful and relevant. Products must include full disclosure of information and provide a quick, convenient method of purchasing without requiring the visitor to call or mail the company. Slow loading, flashy eye candy, animations and music are usually not impressive to visitors unless you are selling tools to create these effects. If you must use them, make them optional. This gives visitors the choice of using these options. The surest way to lose visitors is to force them to wait or listen to your musical preferences. Make links in your site informative. Let your visitors know what to expect and give them a compelling reason to want to follow hyperlinks on the site. List the download time and size of large photographs or other files. Design the website to allow for future growth without requiring major changes to the navigation systems. Design the site so that visitors using slow modems or those that behind corporate firewalls can quickly view major sections. Some technologies like Java Applets and pages without RSACi ratings may be filtered out and unavailable to many users even if during testing it works fine. RSACi ratings (which are just single meta tag lines in your page header) can allow your page to pass parental control filters as well. Be careful of using frames to frame other sites pages or content within your site. It can be construed as a copyright violation. Even linking into some sites interior pages has been known to get the linking site sued. Study and emulate other successful techniques and tactics. Do not copy other people’s work but be unique, stand out and do it better. Printed catalogs allow easy perusal of multiple product choices, and are invaluable as examples of short ad copy, photographic layouts with bullet points, ways to list prices, special offers, etc. Did you ever notice how catalogs tend to have a special deal or closeout price on almost every page to entice people to order? Do not add visitor or customer contact information (names, e-mail addresses, etc.) to your contact lists without their express permission. Do not grab visitor’s e-mails from their browser since this is commonly considered a violation of privacy. Write positive statements about what your products or services do, not what they don’t do. Personalize messages to your visitors and customers using mail merge templates. Automated immediate e-mails can be sent during interactions with the website (opt-in, ordering, affiliate sign-up, etc). Include calls to action to prompt visitors to order, and give them reasons to act soon (e.g. expiring offers and discounts). Up-sell accessories or higher priced items. Bullet points make it easy for customer to scan quickly. Use longer sales copy for extended reading. Study Internet marketing manuals listed in the Appendix of Resources for more in-depth coverage. People process information in specific ways. Design your site to mirror this process. They read from left to right, top to bottom. Most eyes will automatically gravitate to the top left corner, top header line, left or right top sidebars, bottom trailer and the bottom right hand corner. Write bold headlines to grab attention. Shapes are usually recognized first, actual words last and the mind narrows its focus on each page. The eye is drawn to sharp contrast and distinct patterns. Use animation, large fonts, red highlights, sparingly and only to draw attention to something specific. Study the Web Style Guide by Harvard Press (see the Appendix of Resources). This is a great resource for human interface design issues. Remember that a large number of web users are new to computers and the Internet. Scrolling a web browser, changing screen resolution, installing a screensaver and clicking a graphic with a hyperlink are common tasks to web designers but may be difficult for people who have simple, basic computer knowledge. Who will be more successful the designer who accepts the limitations of his audience and works with them or one who dismisses computer novices? Non-web advertising using the domain name may be the most important way to market a business. This is usually the client’s responsibility. The tips and guidelines given here can be used at the client’s discretion. Each site is unique and marketing strategies which work for one site, may not be suitable for another. Encourage other sites to link to your website without having to link to theirs when possible. Making graphic and link information available to other sites will encourage and facilitate a partnership. Make it the client’s responsibility to cultivate linkage with other sites since this is a time consuming task. Another important marketing tool is linking your site with search engines. Create pages optimized for search engine placement. The final results will vary over time. Search engine rules, rankings and listings vary over time and are out of your control. No matter how good a website might be, it must be visible, accessible and readily available. You must get the people there. A site which only has links in a search engine, will probably fail to generate significant traffic. Remember that the Internet is a new interactive communications medium. Businesses on the Internet are still bound by the laws of supply and demand. It still takes marketing strategies to be seen and salesmanship to sell. Concentrate on customer service and personal service. Use the Internet as a tool to communicate rather than a tool which isolates you from your customers. Use advertorials and endorsements to market affiliate programs for other sites that you personally endorse. Make sure these sites fit within the context of your own website rather than simply trying to cultivate a "banner farm". Photography is a subtractive process whereas web development is an additive process. Busy web pages are a common problem. Photography teaches you to remove unnecessary elements that detract from the subject, a very useful tactic for developing a website. Eliminate hype and concentrate on useful content and information. Follow tried and true basic marketing techniques (benefits, features, solving problems, using the right words and images to invoke desired feelings, calls to actions, etc.) Give your audience what they are looking for -information to help them. Join the major web design and marketing newsletters (see the Appendix of Resources) to keep abreast of the latest ideas from web development communities. Find out about new trends, tools and resources. Think in terms of end results and simple goals. Guide visitors to the desired goal. Regardless of where a visitor first enters your site, you can still redirect them to pages you want them to view first, such as product information. Then you will be able to lead them through the ordering process while allowing immediate links to other pages. For example, if someone enters the site through your newsletter signup page, will you be able to guide them to the main information page, and ordering page? From any of these pages, can they immediately navigate to your contact information page? Test multiple designs and pick what works best. The overall infrastructure and design for the sites developed by us have been tested and changed constantly to arrive at the designs we use today. Don’t be concerned about getting it right the first time. A complete redesign will refresh your site and improve results, even if the previous design was good. It takes time to learn the nuances of good design. When creating a great photograph the difference between a good shot and a great one is often due to subtle nuances. This applies to web design as well. When you see a great image or website you instinctively know it. When you see a good one, a few mistakes catch your eye and distract your attention, but you know quickly when you are viewing a bad site because the mistakes are obvious. Consider using an on-line database of information also as a set of static web pages. Static pages will add more pages to the site, and allows them to be indexed by search engines, easily bookmarked and linked to and from outside sources. In general you should not use free services on a commercial website. Would you seriously consider ordering from a company that that refused to invest a mere $35 a year or even $10 a month to maintain their own domain? Would you be comfortable ordering from a company that had no secure on-line order form? There are always exceptions to these rules and you will hear arguments from all sides. Use what works for your business and your clients. Use the right tools for the job. If you are selling business to business, you should always be professional. A business site should be designed from a customer or audience perspective. Topics should be tailored to them, not to you. For example, a major telecommunications company made the mistake of dividing its major website topics around the divisions of its company, which was not customer oriented. It subsequently was redesigned based on how their customers viewed their business. Use powerful words in your copy such as: "you, your, money, save, free, now, how-to, quick, new, exciting, love, secret, reveal, discover, improved, guarantee, latest, amazing, offer, important, revolutionary, powerful. Read catalogs and study the copy on every-day products. Notice how they use calls to action, buzz words and power words to effectively communicate. Just as animation and red highlights use power words one at a time and sparingly, they loose effectiveness when used excessively. Avoid using words and phrases with negative connotation such as: "but, try, could have, would have, should have, cannot, not". This puts the reader in the wrong frame of mind. The mind is much better at resolving concepts if there are fewer choices. Give your visitors a mental picture of a clear, reachable and present goal. Speaking in the past tense can sound old and outdated. Speaking in the future tense may evoke feelings that are not yet attainable. Read your copy carefully to ensure it evokes feelings you intended. Over the course of several days or weeks, read through your site multiple times. You will find things you overlooked when you were "too close to the chalkboard". Use a common frame of reference to introduce a new concept. It is easier for someone to understand a new idea or concept if it relates to the familiar. For example, when trying to explain generational residual income using an affiliate marketing program, use a familiar parallel. Elvis’s family will always be wealthy because every time one of his songs is played, the family gets paid. With the emergence of each new media, his songs will be reproduced and resold again and again and the estate will continue to amass royalties/residual income. The same holds true if you rent a house, you have nothing to show for it except a stack of receipts. You’ve built wealth for the owner because he holds all the assets. But if you own the house, you have an appreciable asset that generates income. If you own the business and/or affiliate program, it can increase in value creating residual income for you and future generations. To prevent spammers from harvesting your e-mail addresses, do not ever post e-mail addresses directly on the web site (or in on-line forums). For forums, use a throw away e-mail address. For your web site, use a contact web form which will then send the e-mail to you. Add a custom 404 page not found error page to your web site. This is a small XML file created by a P3P creation tool which is referenced in your web page headers. This technique will ensure fewer cookie blocking problems with web surfers using your site. The editable Project Design Tips document - complete with the actual formatting and layout is available in the retail Proposal Kit Professional.